First of all, these two disciplines have different names, and there's a reason for that. Architecture is a means to transformation, but it is not the same as transformation. Architecture enables transformation, but by itself is not enough to effect successful t ransformation. There are a whole bunch of other things that you have to do. 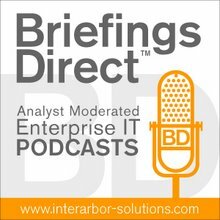 My second concern is that right now, the discipline of enterprise architecture is sort of undergoing -- I wouldn’t call it an identity crisis -- but certainly, it's the case that we still really haven't come to a widespread, universally shared understanding of what enterprise architecture really means. My position is that they're two separate disciplines. Enterprise architecture is a valuable contributor to enterprise transformation, but the fact of the matter is that people have been transforming enterprises reasonably successfully for a long time without using enterprise architecture. So it's not necessary, but it certainly helps. ... There are other things that you need to be able to do besides developing architectures in order to successfully transform an enterprise. Gardner: As a practitioner of enterprise architecture at Ciena Corp., are you finding that your role, the value that you’re bringing to your company as an enterprise architect, is transformative? Do you think that there's really a confluence between these different disciplines at this time? I agree with what Len said. Enterprise transformation is different. It's a huge task and it is the actual end. Enterprise architecture is a profession that can help lead the transformation successfully. Rouse: There are two distinctions I’d like to draw. First of all, in the many transformation experiences we've studied, you can simplistically say there are three key issues: people, organizations, and technology, and the technology is the easy part. The people and organizations are the hard part. Gardner: Len Fehskens, are we actually talking about IT architecture or enterprise architecture and what's the key difference? Fehskens: Well, again that’s this part of the problem, and there's a big debate going on within the enterprise architecture community whether enterprise architecture is really about IT, in which case it probably ought to be called enterprise IT architecture or whether it’s about the enterprise as a whole. For example, when you look at the commitment of resources to the IT function in most organizations, depending on how you count, whether you count by headcount or dollars invested or whatever, the numbers typically run about 5-10 percent. So there's 90 percent of most organizations that is not about IT, and in the true enterprise transformation, that other 90 percent has to transform itself as well. Gardner: But, Len, don't TOGAF at The Open Group and ArchiMate really step far beyond IT? Isn’t that sort of the trend? Fehskens: It certainly is a trend, but I think we've still got a long way to go. Just look at the language that’s used in the architecture development method (ADM) for TOGAF, for example, and the model of an enterprise architecture. There's business, information, application, and technology. Well, three of those concepts are very much related to IT and only one of them is really about business. And mostly, the business part is about that part of the business that IT can provide support for. Yes, we do know organizations that are using TOGAF to do architecture outside of the IT realm, but the way it's described, the way it was originally intended, is largely focused on IT. What is going on is generally not called architecture. It's called organizational design or management or it goes under a whole bunch of other stuff. And it's not referred to as enterprise architecture, but there is a lot of that stuff happening. As I said earlier, it is essential to making enterprise transformation successful. But Bill made a really important observation, which is that it can't be solely about IT. There's lots of other stuff in the enterprise that needs to transform. We've got to continue to push that enterprise architecture is about designing the way this company will do it business, and that it's far beyond the scope of IT alone. I take it back to the transformation discussion. What we find is that when a company really understands enterprise architecture and embraces it, it will go through a transformation, because it's not used to thinking that way and it's not used to acting that way. If management says we're going to start using IT strategically, we're going to start designing ourselves so that we have disciplined business processes and that we use data well. The company is embracing enterprise architecture and that will lead to a transformation. Gardner: You said that someday CIOs are going to report to the enterprise architects, and that’s the way it ought to be. Does that get closer to this notion that IT can't do this alone, that a different level of thinking across disciplines and functions needs to occur? Ross: I certainly think so. Look at companies that have really embraced and gotten benefits from enterprise architecture like Procter & Gamble, Tetra Pak, and Maersk. At P&G’s, IT is reporting to the CIO but he is also the President of Shared Services. At Maersk and Tetra Pak, it's the Head of Global Business Processes. Gardner: There's some cynicism and skepticism around architecture, and yet, what we’re hearing is it's not in name only. It is important, and it's increasingly important, even at higher and higher abstractions in the organization. Fehskens: Dana, I think that’s the $64,000 question. The fundamental way to get architectural thinking accepted is to demonstrate value. I mean to show that it really brings something to the party. That’s part of my concern about the conflation of enterprise transformation with enterprise architecture and making even bigger promises that probably can't be kept. The way to get architectural thinking integrated into an organization is to use it in places where it can deliver obvious, readily apparent value in the short-term and then grow out from that nucleus. Trying to bite off more than you can chew only results in you choking. That's the big problem we’ve had historically. It’s about making promises that you can actually keep. Once you've done that, and done that consistently and repeatedly, then people will say that there's really something to this. There's some reason why these guys are actually delivering on a big promise. The number one and two things you need are the top leader has to have a vision of where you’re going and they have to be committed to making that happen. Without those two things, it seldom happens at all. From that perspective, I'd argue that the CIO probably already does report to the chief architect. Bill Gates and Steve Jobs architected Microsoft and Apple. Carnegie and Rockefeller architected the steel and oil industries. Gardner: So if what I think I'm hearing is correct, how you do things is just as important as what you do. Because we’re in such a dynamic environment, when it comes to supply chains and communications and the way in which technology influences more and more aspects of business, it needs to be architected, rather than be left to a fiat or a linear or older organizational functioning. Rouse: Let's start with the basic data. We can't find a single instance of a major enterprise transformation in a major company happening successfully without total commitment of top leadership. Organizations just don’t spontaneously transform on their own. A lot of the ideas and a lot of the insights can come from elsewhere in the organization, but, given that the CEO is totally committed to making this happen, certainly the COO can play a crucial role in how it's then pursued, and the COO of course will be keenly aware of a whole notion of processes and the need to understand processes. One of the companies I work very closely with tried to merge three companies by putting in ERP. After $300 million, they walked away from the investment, because they realized they had no idea of what the processes were. So the COO is a critical function here. Just to go back to original point, you want total commitment by the CEO. You can't just launch the visionary message and walk away. At the same time, you need people who are actually dealing with the business processes to do a lot of the work. Ross: I'd say the relationship between enterprise architecture and enterprise transformation is two-way. If an organization feels the need for a transformation -- in other words, if it feels it needs to do something -- it will absolutely need enterprise architecture as one of the tools for accomplishing that. It will provide the clarity the organization needs in a time of mass change. People need to know where they're headed, and that is true in how they do their processes, how they design their data, and then how they implement IT. It works just as well in reverse. If a company hasn't had a clear vision of how they want to operate, then they might introduce architecture to provide some of that discipline and clarity and it will inevitably lead to a transformation. When you go from just doing what every individual thought was best or every business unit thought was best to an enterprise vision of how a company will operate, you're imposing a transformation. So I think we are going to see these two hand-in-hand. Naidu: Like I mentioned in the beginning, one is end, another one is means. I look at the enterprise transformation as an end and enterprise architecture providing the kind of means. In one way it's like reaching the destination using some kind of transportation mechanism. That’s how I look at the difference between EA and ET. Fehskens: One of the fundamental principles of architecture is taking advantage of reuse when it's appropriate. So I'm just going to reuse what everybody just said. I can't say it better. Enterprise architecture is a powerful tool for effecting enterprise transformation. Jeanne is right. It's a symmetric or bidirectional back-and-forth kind of relationship.